Metro Council must still decide on requests by Beaverton, King City, Hillsboro and Wilsonville to create 9,200 new homes in region. Metro should expand the urban growth boundary it administers by 2,200 acres to help accommodate 9,200 new homes, says Martha Bennett, the elected regional government's chief operating officer. The Metro Council considered Bennett's recommendation during a Sept. 4 work session on UGB expansion requests by Beaverton, King City, Hillsboro and Wilsonville. She recommended that all four requests be approved, saying they should result in the construction of a range of needed housing in the foreseeable future. "These cities have demonstrated governance, infrastructure and market factors that will lead to housing development," Bennett said when her recommendation was released last Tuesday. The UGB determines where new development can occur in the three-county region. 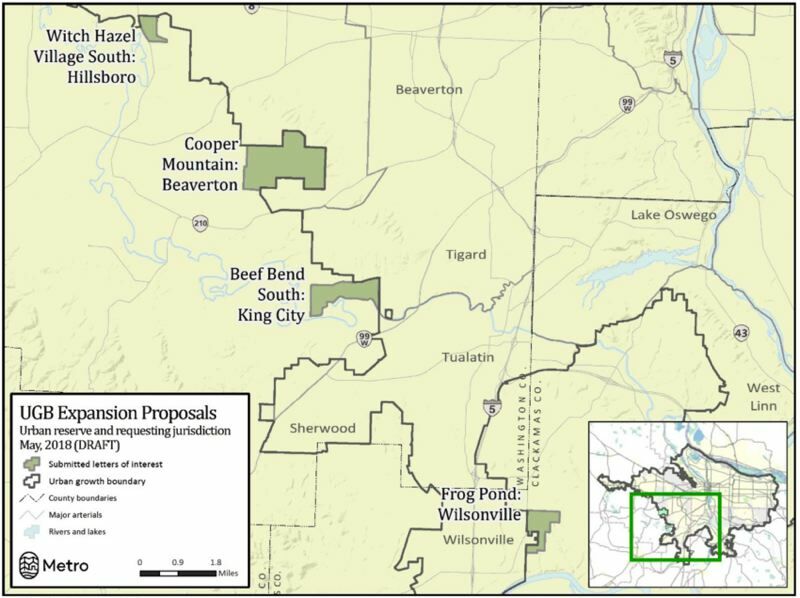 The largest request is from Beaverton, which wants to expand onto 1,232 acres in the Cooper Mountain urban reserve area for 3,760 homes. The next largest request is from King City, which wants to add 528 acres in the Beef Bend South area for 3,300 homes. After that, Wilsonville wants to expand onto 271 acres in the Advance Road (Frog Pond) area for 1,325 homes. And Hillsboro wants to expand onto 150 acres in the Witch Hazel South area for 850 homes. The council has the final say on the requests, however. Although it must vote of them by the end of the year, there is no guarantee than any — let alone all — of them will be approved. During a July 17 work session on the requests, some councilors were concerned the expansions would not produce enough affordable housing, among other things. Council approval of some or all of the requests would be a change from the last time the council reviewed the UGB in 2015, when it voted that no expansion was needed to accomodate the hundreds of thousands of additional people expected to be living in the region in 20 years. That decision was criticized by area home builders and others as unrealistic, prompting the council to review the UGB again sooner than usual. The council also subsequently revised the review process, requiring cities wanting expansions onto adjacent urban reserves to submit proposals with details about such things as how infrastructure improvements would be financed. The council also required such cities to promise a range of housing, including homes affordable to households earning below the area's median family income. The council also wanted existing urban areas to be developed. Bennett said the four cities understood the requirements, noting, "All four cities are working to reduce barriers to development in their existing urban areas and seeking to improve their engagement with diverse communities." In the recommendation, Bennett also called on cities to allow more types of housing in their expansion areas. She said cities should encourage construction of accessory dwelling units in expansion areas, including removing legal barriers to construction of ADUs in new communities. The expansion requests are supported by the Home Builders Association of Metropolitan Portland, PGE, Clackamas County, the Clackamas County Business Alliance, state Senator Kim Thatcher (R-Dist. 13), the Westside Economic Alliance, and the Community Housing Fund. "As you are aware, the Portland metropolitan area is in the midst of a housing supply and affordability crisis. It is time to act," the WEA wrote the council on Aug. 15. The four requests now being considered by the council were submitted earlier this year. The Sherwood City Council withdrew a fifth preliminary application in the face of community opposition. A public hearing on the requests and Bennett's recommendation will be scheduled for the fall. You can read Bennett's recommendation at https://tinyurl.com/yc8u4xot.